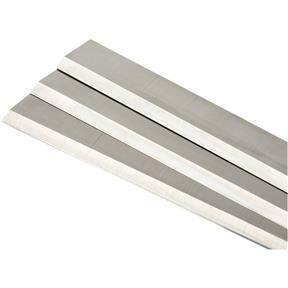 These 6" x 5/8" x 3/32" (155 x 15 x 2.5mm) Jointer Knives are made from HSS steel and are for our G0452 6" Jointer. I'm happy with these knives. There was some confusion when they arrived however. The description says the are 3/32" thick and the wrapper they came in said 1/8". My jointer doesn't accept 1/8" knives so I was a bit concerned. I checked the thickness with callipers and they measured .105". That's thicker than 3/32 (.09375") but they still fit my jointer, so all is good. These blades were easy to install and set. They were as a economical as having my old set resharpened. 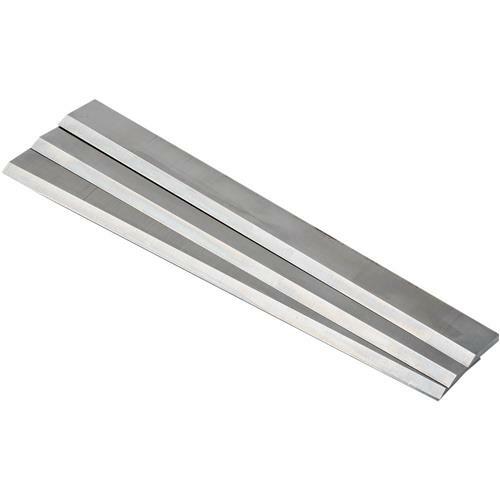 These replacement blades fit perfectly and for the price why sharpen you old ones! I found it cheaper to buy a new set to have a spare when one is resharpend. I've had my Grizzly G0452 jointer for about 9 years now, and these are the knives that go with it. Brand new they cut glass smooth and leave a nice flat surface. However, sometimes it seems like they chip or nick easier than I'd like. Even so, they aren't that expensive. The biggest hurdle is installing them so they're even with the outfeed table, and that's not the product's fault. It's just the nature of setting jointer knives most of the time! Anyway, these work well, and I like the surface they leave, especially when brand new! Bought these blades for my joiner and love them. Nice and sharp leaving a smooth finish. Highly recommend these. These are really good jointer blades. I have an old Atlas jointer that I can't get stock blades for. These fit and made the machine work like new. Bought 5 sets of these knives while they were on sale for about 1/3rd the regular price. great deal I just hope it don't mean they are being discontinued. I like Grizzly tools they don't cost an arm and leg and they work great. I bought these knives to have a replacement on hand when the old ones wear out. That may be next month or next year... either way they'll be handy. Like all other tools from Grizzly, I am certain they will work as expected and past through plenty of hard use.